This cocktail is a Kahlua, Bailey’s Irish cream, and Frangelico trio shaken up with chocolate and iced Counter Culture coffee. If you’re thinking dessert, you’re thinking correctly, as most coffee cocktails fall under that category. 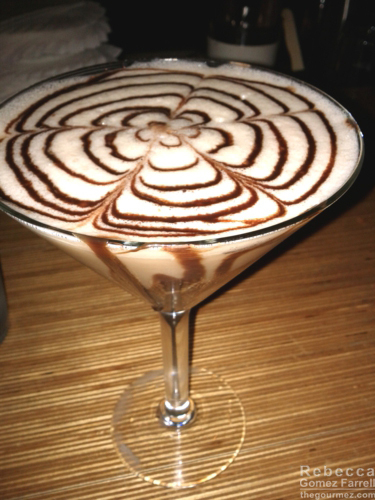 The drink is indisputably gorgeous with that chocolate pattern laced into the lovely layer of foam on top. I think milk must be a secret ingredient, or this drink has a very healthy dose of Bailey’s that doesn’t come across when drinking it. The coffee is subsumed by the milky elements. Of the alcoholic ingredients, Frangelico comes through loud, clear, and nutty. It has that tendency. The Boy’s Club is an attractive drink, but it needs more coffee. The Borough’s drinks are the best! I don’t think I’ve been disappointed yet.